Story by rollouthandball.com, Paul Fitzpatrick- The eighth annual Cavan 40×20 championships serve off this Friday in Kingscourt, with a field of 80 players entered for the weekend tournament, including over 50 juveniles. Star attractions once again will be senior stars Michael Finnegan and Paul Brady – the ten-time All Ireland senior doubles champions will be hot favourites to advance to the final of the blue riband senior singles, where they will be opposed by James Brady, Patrick Clerkin, Killygarry footballer Padraig Cahill and Paul Fitzpatrick. The junior A Singles boasts a strong field including the likes of former Cavan underage footballer Brian Reilly, Cathal Sheridan from Ballyconnell and Declan Smith from St Pat’s. Number one seed is recently-crowned US Nationals C Singles champion Daryl Dolan, a former All-Ireland rounders medallist from Mullahoran. Also in the mix will be u16s Caolan Smith and Stephen Smith, who head a strong field in their own age group which also includes Crosserlough left-hander Shane McVeety and Kingscourt’s Cillian O’Reilly. The Junior B grade also boasts a strong entry in particular from the Munterconnaught club. U14 will be a very competitive grade with Conor Owens, who defeated Brandon Boylan in an 11-10 tiebreaker in last year’s final, eligible again. Crosserlough footballer Brandon will be hopeful of over turning that result, with Cian Boylan, Leo Doyle, Emmet Boylan, Diego Di Falco and Shane Burns also in the mix. It will be a hectic weekend for some of the St Pat’s representatives, who are in action in the Corn na nOg final in Scotstown on Saturday morning before motoring to Kingscourt for the handball. The U12 grade features many rising stars including Mullagh’s Patrick Gordon and Seamus Obesengi, Matthew and Ben Smith and the very promising Sean McEvoy from Virginia and Corey Gilsenan, Cian Embley-McGovern and Caolin Hughes from Munterconnaught. 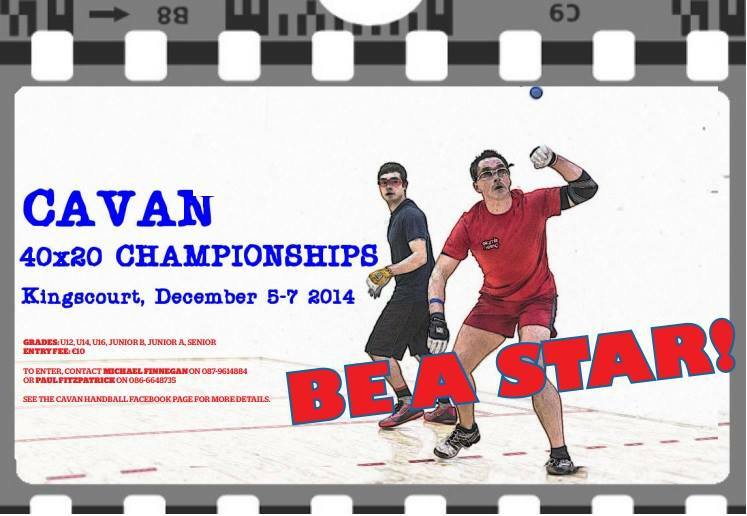 An excellent weekend’s handball is expected – details to be found on the Cavan handball Facebook page.